Vinyl lettering is a professional look to enhance any glass or office window. Display employee names, titles, conference room and department names with adhesive vinyl window text and graphics. We can create in virtually any color! Corporate Logos, Interior Graphics, Wall Murals, Window Graphics, Fleet Graphics, Store Window Hours / Business Hours, Installation of any Signage or Vinyl Graphics. 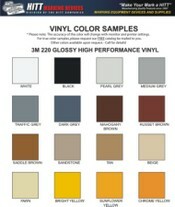 Spray Paint Mask Stencils, Priced 1" to 42"
Used for stencil applications, especially for paint and spray applications.